Follicular adenocarcinoma, also known as follicular thyroid carcinoma, is a cancer of the thyroid gland. This gland, located in the front of the neck, just below the Adam’s apple, secretes thyroid hormones, the chemicals that influence metabolism and protein synthesis. Thyroid hormones are produced by follicular cells. This malignancy of the thyroid gland the second-most common type of thyroid cancer, just after papillary carcinoma. According to NHS.uk, follicular adenocarcinoma accounts for one in ten cases of thyroid cancer. Though compared to papillary carcinoma, follicular adenocarcinoma is far more aggressive. Thyroid cancers typically occur when thyroid gland cells undergo changes that lead to the formation of a lump. It’s currently unknown what causes these changes; however, certain factors can make a person more susceptible to follicular adenocarcinoma. These include a family history of thyroid cancer and exposure to radiation. Additionally, follicular adenocarcinoma is more likely to develop in people above 40 years of age, particularly if they’re women. As per ColumbiaSurgery.org, people who have follicular adenocarcinoma often don’t even know that they have the disease in the first place. 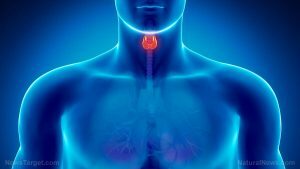 The primary symptoms will manifest in people with large nodules, those symptoms being a palpable and visible mass around or within the thyroid gland area. This mass can make swallowing difficult and cause a person who is lying flat on their back to feel shortness of breath or pressure on their chest. A mass that has reached a considerable size will aggravate these symptoms further, and potentially cause the affected person to gain a more hoarse voice and cough more frequently. Follicular adenocarcinoma impacts the thyroid gland. As a highly aggressive cancer, however, this type of cancer has the potential to metastasize and harm other organs and organ systems. The veins and arteries are most at risk from this condition, followed by the lungs, bones, liver, bladder, brain, and skin. The lymph nodes may be damaged as well, though EndocrineWeb.com notes that this more common in papillary carcinoma than in follicular adenocarcinoma. The most common treatment for follicular adenocarcinoma is surgery. The two available surgery options are a thyroid lobectomy (wherein half of the thyroid gland is removed) or total thyroidectomy (wherein the entire thyroid is taken out). In most cases, a total thyroidectomy is the better option since it saves the patient from a second operation. Following surgery, the patient will then need to go through thyroid hormone therapy. This will involve taking thyroid hormone pills on a daily basis to help maintain the body’s metabolism and to prevent the growth of any remaining cancer cells. The patient may also need to undergo radioactive iodine ablation, also known as remnant ablation. Rather than improving the patient’s prognosis, radioactive iodine ablation is meant to lessen the recurrence rate of follicular adenocarcinoma. Furthermore, chemotherapy and traditional external beam radiation therapy are saved for patients whose follicular adenocarcinoma has progressed into other parts of the body. As with most other cancers, the risk of follicular adenocarcinoma can be decreased by adhering to a healthy lifestyle and diet, and by reducing alcohol consumption and cigarette smoking. Follicular adenocarcinoma is a type of thyroid cancer that affects the follicular cells of the thyroid gland. This is the second-most common thyroid cancer and has a higher chance of occurring in women above the age of 40. The lump that forms on the thyroid gland can cause a person to experience difficulty swallowing and breathing, and make them more prone to coughing and having a hoarse voice, all of which are symptoms of follicular adenocarcinoma. Surgery is the most viable treatment for follicular adenocarcinoma, followed by thyroid hormone therapy and possibly radioactive iodine ablation.